Chic Fuel : ThinDish - app to track calorie intake! It’s that time of year again! The holiday treats are done and now it’s time to get back on track! When you constantly have things on the go and you are always running around it’s hard to keep track of what you are eating each day in order to maintain a healthy diet. Well now, there’s an app for that! 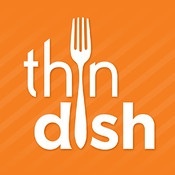 ThinDish is a free app you can download on your phone that allows you to take pictures of what you eat and calculate the calories you consume. An added feature is that it shows you exactly how much exercise, and what type, you have to do in order to lose what you just ate. It’s so easy to use! Just snap a picture of what you ate and come back and tag it later. Now you know exactly what you ate that day! Create a visual dairy of your weight loss journey. Search a massive food database with nutrition for over 500,000 ingredients. Track your daily calorie, fat, carb, and protein intake. Shoot a photo and don't let your meal get cold; it's just not cool to log your food at the table. Use your photos to log your meals or activities at any time. Quickly find out how to burn off your meals. Easily add your own custom ingredients and activities in a matter of seconds. Click on the image to get your ThinDish App!